Matthew Holm, an author and illustrator, is the co-author of Marvin and the Moths, a new novel for kids, and Little Babymouse and the Christmas Cupcakes, a new children's picture book. 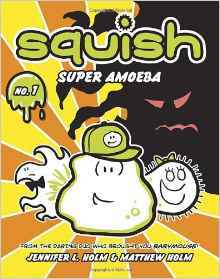 His many other books for kids include the Babymouse and Squish series of graphic novels. He lives in Portland, Oregon. Q: How did you come up with the idea for Marvin and the Moths, and how did you and your friend and co-author Jonathan Follett divide the work on the book? A: Jon and I have been friends since middle school, so it only seemed appropriate that we write a book about the horrors of middle school. The idea actually first came to us when we were on vacation with our wives at a cabin in Maine. It was a bit, shall we say, rustic. Enormous moths were flying around, and spiders the size of hamburgers were crawling in the sink. Jon and I always start making little stories to amuse ourselves, so on this occasion, we asked ourselves where these oversized bugs came from. Did they drink the fruit punch we brought, and it had an unusual effect upon them? Did they eat some of our breakfast meat, and it caused them to mutate? Eventually, we sat down and started to work out the story for Marvin and the Moths, about a 12-year-old boy (Marvin Watson) who discovers that giant, superintelligent (and very sarcastic) moths are living in his attic. I was living in New York's Hudson Valley at the time, Jon was living in Boston, and I'd drive up for the weekend and we'd have marathon writing sessions together at his house. Then, I moved to Portland, Ore., and we had to figure out a new way to work. Google Docs was introduced to the public around that time, and we realized that, not only can you share a word processing file, but if two people open it at the same time, you can actually type and the person on the other end will see your words appear on the screen almost instantly. So our "writing room" got a bit bigger. We would call each other on the phone, both open the same doc, and start talking and typing. We even worked that way while I was living in China for three months last year! 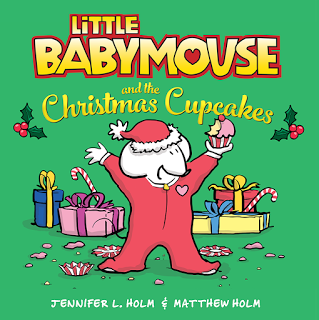 Q: Another of your new books is your first picture book, Little Babymouse and the Christmas Cupcakes, on which you collaborated with your sister, author Jennifer L. Holm. Why did you decide to do a picture book about Babymouse, and what's it like collaborating on books with your sibling? A: When we started working on Babymouse, one of our main goals was to make comics for kids again. Throughout the late ’80s and ’90s, comic books had become darker and grittier, and written almost entirely for adult readers. There were surprisingly few titles left that were appropriate for kids. 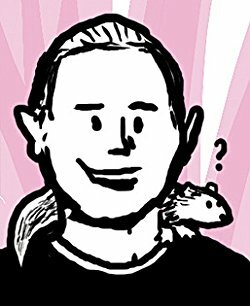 So we wrote the Babymouse graphic novels for kids in elementary school—which was the age at which we, personally, engaged with comics the most. As time has gone on, more and more comics for elementary-age kids have come out. Which is awesome! It's so great that so many of us are working in this category now. 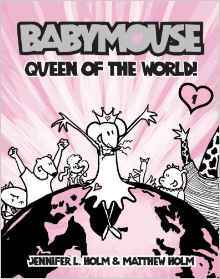 So we've decided to expand our horizons a little more, and try to reach kids before they hit the age range for reading the Babymouse graphic novels, which are really for independent readers. We were working on some board books for very young readers (the "My First Comics" series, which so far includes the titles I'm Sunny and I'm Grumpy), and then we figured we should fill the remaining gap, namely, those kids in the picture-book range! The result is Little Babymouse and the Christmas Cupcakes, in which our heroine, at the tender age of four, finds herself on Christmas Eve having accidentally eaten all of the cookies she was leaving out for Santa. It was a lot of fun bringing comics to this age group, as well as bringing Babymouse, with her can-do attitude and her wild imagination, to a new bunch of readers. Working with my sister is actually quite easy. She's six years older than I am, so growing up, she mostly ignored me. I was that "annoying baby brother," but I was mostly not in her social orbit. We didn't get into the kind of fights that siblings closer in age to each other do, so we never had that baggage as adults. Plus, we both worked in industries where your work is heavily edited and critiqued (I was in magazines, she was in advertising), and as a result we don't take criticism of our work very personally. It's also extremely handy to work with someone who has so much shared history, because it makes communicating ideas while we're working on stories—especially stories inspired by events in our own lives—much easier. Q: You have seven new books out this year! How do you organize all your work? Do you go from one book to another, or try to finish one before moving ahead? I would love to be able to finish a project completely before I start the next one—so I don't feel like it's still hanging over my head—but that's never possible. Instead, I'm always working on multiple books at the same time. Usually, I'll be doing pencil sketches for one book and then switching to inking a different book while those sketches are being reviewed, then revising a manuscript for a third book before switching back to inking the first book, and on and on. Trying to keep track of it all gets a little dizzying sometimes! Q: What do you see as the relationship in your work between writing and illustrating? A: I have a fairly unusual relationship to writing and illustrating, I think. I'm often called an illustrator, and it's true that the vast majority of my work involves me drawing. But I was an English major in college, and I wrote for a magazine for eight years after college before switching to illustrating Babymouse, so I really always think of myself as an author—an author who also happens to draw. To me, there is far less difference between the two—they're just storytelling. I've also done graphic design for many years, and I think of it all the same way: What's the best, clearest, most effective way to communicate this information? Sometimes it's with words, sometimes it's with pictures. A: Right now I'm working with Jenni on a sequel to Sunny Side Up. I've finished the sketches and am partway through the inking. With luck, I'll be wrapped up on that sometime after the first of the year, and people can look for it later in 2017. A: Jenni and I have a new Babymouse book coming out next year. It's another new format for Babymouse: a hybrid book, with both text paragraphs and comics (like Dork Diaries and Diary of a Wimpy Kid). It's the first in a new series called "Babymouse: Tales from the Locker," in which Babymouse is slightly older: in middle school. This volume is Lights, Camera, Middle School! Look for it in bookstores July 4, 2017!